From Bangkok statue of the Buddha on the altar. Monument Valley on 23 September 2526 at 11:49 AM Three Kings Monument Paya Mangrai Roung and Praya kroum Mueang. 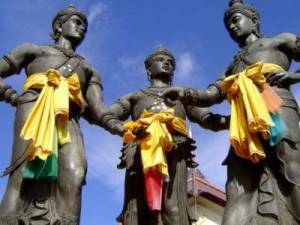 This is the first time in the history of Thailand The three kings. He has shared his plans to build the city. Which appears the inscription. King Three Kings Monument.